Hello there WOYWWers! I am playing and playing. My plan today is to carry on with the original idea for the pyramid thing from yesterday. Petrina and I have been chatting via email and she is happy for me to alter the template slightly so I’ll probably give that a go first, then carry on with creating. My desk is looking like this today – not too bad, for a change. The one thing worth mentioning is those brush looking things on the left. Sorry in advance for the upcoming rubbish photo. I took it then it got dark before I uploaded it, and only then found it was blurry. Popped in to town with DD yesterday to sort her new glasses, and I found these in a store called The Works. They are soft rubber tools, perfect for the Gelli plate. I saw some at an art shop for over $20 so £2.99 is a deal. I have a little pile of Gelli pulls on contact paper, but a couple of them I have to hide, lest someone who I don’t want to see them, sees them. And to update – the electrician was here again yesterday, for HOURS, but he seems to have fixed the power issues – turning off the kitchen light no longer trips the circuit YAY! It’s safe to leave my Mac on. Fingers crossed . Looking forward to desk hopping today – shopping and ice skating, as ever on a Wednesday, but I really want to see what everyone is up to! 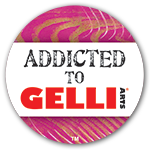 Categories: Gelli plate monoprints, Uncategorized, WOYWW | Tags: art techniques, Gelli, Gelli plate, WOYWW | Permalink. 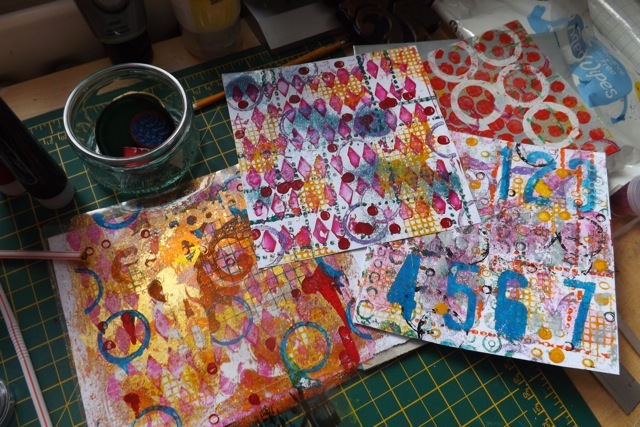 Wonderful Gelli prints, can’t wait to give it a try. Someone has been having lots of inky fun! Enjoy!!!!! Oh, I would love to go ice skating. Haven’t been in years. Kinda not in the neighborhood here. It is good to sort out the electrics as it can wreck havoc with our toys. The tools for gelli plates look very interesting . Ooooh !!! 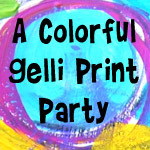 The Gelli prints are fabulous. 🙂 Makes me want to do that too. Lovely tidy desk today MA! 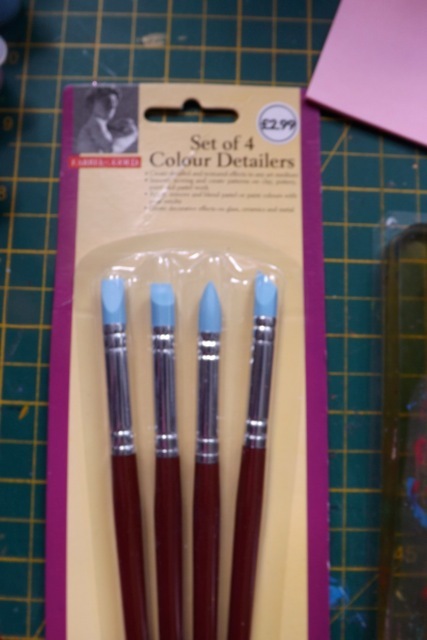 Love your gelli prints , the diamonds and the numbers one are my firm favourites and wowzer to the brush set at that price, you made out like a bandit. We bought those tools from the same shop, for the same purpose. 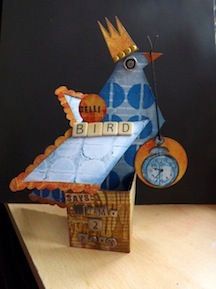 We love your Gelli prints, must get our plate out again for a play. Those gelli prints look great. I love The Works shop. I bought some of those brush things ages ago simply because of the price. Hello Marianne I totally agree with you I also purchased that set of four from the works! 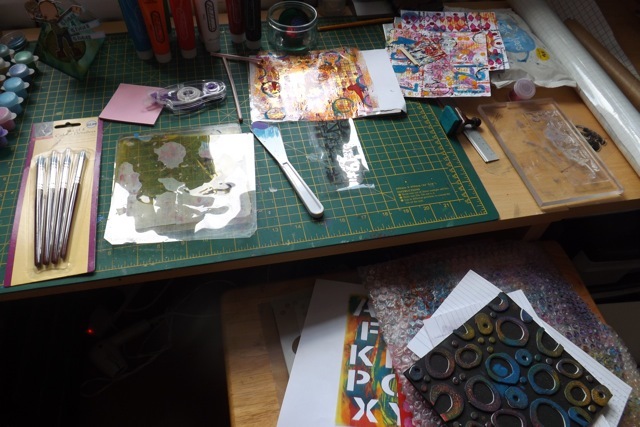 Those gelli plate prints are gorgeous.Oh I wish I had another 4 hours each day to try all these wonderful things I keep seeing! I’ve used those rubber things for oil, acrylic and watercolor painting and for pastepaper. They work geat and the paint comes right off them. The gelli prints are just stunning. I’m amazed how tidy you can keep your desk despite all the inky messing you’re up to.